We ware working on an use-case for How to Create and Deploy Azure Resource Manager Template using Azure Portal. During our deployment we got couple of issues and After fixing the first issue osDisk.managedDisk.id’ is not allowed , we continue with our deployment. After some time we got the second issue as ” adminPassword’ is missing (null) ” as shown in following figure. After googling for some times, we found, when downloading the template.json file, it skip the adminPassword of the Virtual Machine. This might be intentionally done by Microsoft for security reason. 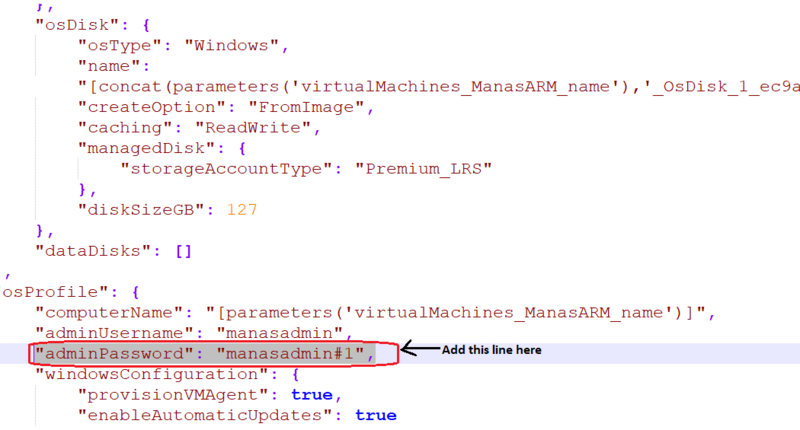 Let’s modify the template to add the adminPassword just below “adminUserName” property, as shown in the following figure. After set the adminPassword property, it fixed the issue for us and we redeployed the template. Very helpful, that two tips saved me a lot of searching and trying. I wonder why the templated I derived out of the Azure portal had these flaws.